Busy Bees Family Home Child Care is the Featured Accredited Business! Busy Bees Family Home Child Care is owned and operated by Cheryl Frankowski since 1994. Busy Bees Family Home Child Care is State Licensed and NAFCC Accredited. As I compiled the interview questions, I thought long and hard about how I can create a business feature that would inspire you to seek Accreditation or to remind you that your decision to seek Accreditation will transform your childcare business. As I reviewed Cheryl’s interview questions below, I was amazed at the level of confidence that she has in the quality of her program and how she focuses on Developmentally appropriate practices. Moreover, the fact that she rarely utilizes, “Time Out” and why she decided to only operate…… 10-hours a day! Check out Cheryl’s Accredited Child Care Business interview: * Please note that I did very little editing to this post, because I really want you to read this post in Cheryl’s voice not mine. Child Care Business Owner: Why did you choose to get your program Accredited? I will try to make a long story short…. About 14 years ago, I was involved with a group of child care providers who subscribed to a package curriculum. As a newer provider at the time, and not having the training since, I jumped on their band wagon of “if you don’t do these activities that everyone else in the area is doing, you will NEVER get any clients!” I did the pre-packaged thing for a while until one day when we were on the letter V and the kids and I were attempting to make a vacuum cleaner out of a paper cup. I realized at that exact moment how incredibly dumb, useless, and inappropriate this project and kit were. The kids looked at me like this is supposed to be a vacuum?” To top it all off, I realized that I was doing most of the work! Every ones “vacuum” ending up looking the same way, there was no room for originality in the end product (all the cups that came with it were red, they didn’t even get to pick their own color!) I thought to myself right then and there, there HAS to be a better way. One day, much later, a letter arrived from the YWCA CCR&R offering a program to become accredited. It spoke of improving your program and taking it to the next level and connecting with other providers looking to improve the quality of their programs. I knew that this was a program that I needed to be involved in! The YWCA CCR&R paid for and provided about 20 hours of training in the different areas needed and gave us equipment and materials to help meet the standards in those areas, a provider mentor to call as well as visits to each other’s homes, and paid for all of the materials and expenses involved in becoming accredited. 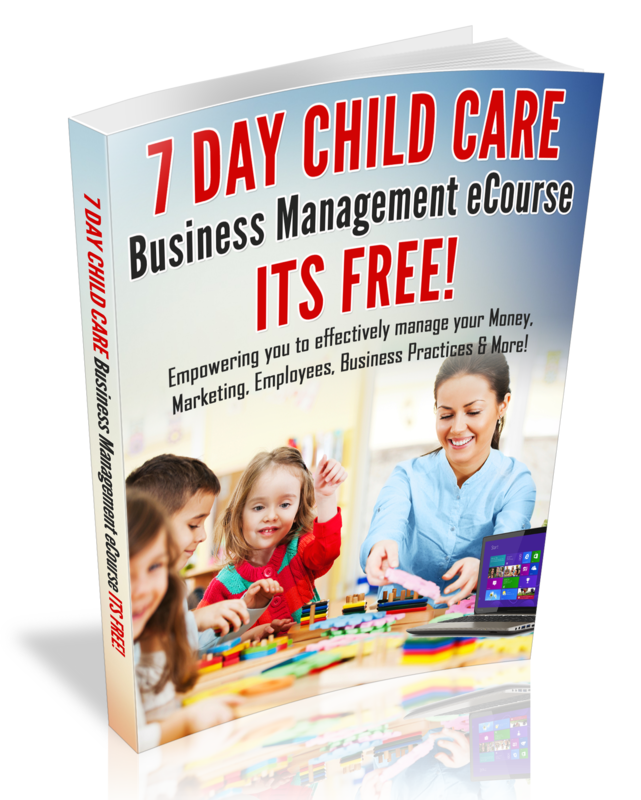 Child Care Business Owner: How has the process improved your program? In ways too many to count! First and foremost, I am a much more confident provider. I know that my home, business and child care space offers a very safe and secure environment. I believe that there is always room for improvement – when I feel that I have found a better/safer way to do something, I implement it almost immediately and let the parents know what I am doing, why and how it will benefit their child. I feel that I am providing the best environment, program, and care that I can offer. I convey this to clients when they come by pointing out the safety features I have implemented, how my program is ran and more importantly, why I run it as I do as well as presenting myself and program in a professional manner. Our art is now process oriented vs product. We do some art projects as gifts during the year, calendars, aprons, hats, shirts that start out the same way but all include some form of open-ended art. My environment is completely different. Because it is laid out for the children, I seldom have to say no to child – they know that if they can reach it – it is theirs to play with. We have enough of manipulatives that the kids can share without fighting. This has greatly reduced the amount of fighting over toys and has encouraged playing together. I de-cluttered my play space visually on a regular basis. I took stuff off the walls and learned that having every space filled with something is/can be distracting to some children, as well as myself. It is filling up again so we will de-clutter again soon! Contracts and policies have been tweaked and re-tweaked to where important issues are spelled out (When they cannot bring their child, house rules, expectations, etc.) I feel very confident presenting my contracts and policies to parents. I rarely have to do any enforcement of contract and policies. Parents know what I expect. I am no longer open from 6am to 6pm. I realized that just because I was licensed for those hours didn’t mean I had to be opened for those hours. I tell parents, that in order to provide consistent quality care, I limit myself to a 10 hour day. Child Care Business Owner: What changes did you have to make in order to become an Accredited program? Rearranged my environment to make it more kid friendly – they can reach what they want, art area is now always open and available in safe and secure way (my kitchen in the play area has a split door that the bottom half can close while the top is open where children can do art safely and uninhibited by the younger crowd and I can still have visual contact with them. Any older kids enrolled can do homework there or play with an age appropriate toy that may have smaller pieces. I used to have an overly structured day. We now have larger blocks of free play time. I do have a basic layout of our day to show parents but am careful to point out that if the kids are really involved with something we will continue to go with that than move on with our day – unless it is a bus pickup issue or nap time. I totally rethought my art area. Art is an open-ended process and the kids really seem to enjoy it more. The parents have always been the hardest to get on board with the art process. A lot still want to know “what is it?” Collage and art materials are always available to the children. I started using Ages and Stages questionnaires as a screening tool. I put up a parent resource shelf that parents can check out educational books that I have collected. I started a child care association to have access to longer and quality trainings closer to home (Our current YWCA training place is about 30 miles away). I rotate toys. I always felt that the kids should have access to EVERYTHING ALL THE TIME!!! Not only did it make for a cluttered space, but the kids lost interest and sometimes couldn’t decide what to play with because there were too many choices. With rotation, it is like a brand new toy every 3 months! Child Care Business Owner: Did you involved the parents or the children in the process? Child Care Business Owner: Did you pay for the accreditation from your business funds? Did you seek financial assistance for the Accreditation? Our county YWCA CCR&R had a wonderful program to assist providers in becoming accredited. It paid for a mentor the first time around as well as all of the materials and costs associated with becoming accredited. I have written for and received full funding for the second and third time as well. Child Care Business Owner: In summary, Why do you recommend that other providers get their program Accredited? If you are struggling with the day-to-day operations of your program, and are feeling burnt out and want to improve the quality of your program I would highly recommend becoming accredited. If you are only looking to have the piece of paper, I wouldn’t go through the time and expense. The observers will see right through it. Truly, accreditation can change your entire business – if that is what you are looking for. I knew of too many providers who simply did what the observer wanted to “see” on the observation day then went back to their old ways. You will truly get out of it what you put into it. You will feel more confident when enforcing your contract and policies. You will feel more confident explaining the advantages and rewards of developmentally appropriate play and art practices. You will feel more confident during interviews with parents (thus weeding out “just taking anyone who comes through the door”) Being accredited has helped me in writing grants and being awarded scholarships and equipment for my program. I am so thankful that Cheryl took the time to answer my business feature questions and most importantly share her accreditation Journey with the readers of the Child Care Business Owner blog! www.bizzybeeschildcare.net or connect with Cheryl on Facebook. Thanks for sharing your program Cheryl. I think you accurately explained what the benefits of accreditation can be for a provider dedicated to growth. Congratulations on finding success and fulfillment in your business! Thanks Michelle for your feedback and yes Cheryl did accurately explain the benefits of Accreditation!